The other night, I made a delicious goat cheese pasta, which was a heavy modification of this recipe from Martha Stewart. My mods included sauteing some garlic and onion in the pan, then wilting the spinach with those flavors. I scaled back on the cilantro and flat leaf parsley in favor of adding some fat, which people who had tried the recipe claimed it needed desperately. I added some sliced prosciutto to my bucatini and goat cheese. The best, and most vibrant flavor, this dish had was definitely the lemon juice and lemon zest; the walnuts were a nice touch, too. A winner, for sure. My new obsession: this baby hat by Purl Bee. I did a few slight modifications for this hat, which will be gifted to a friend and future child. I’m in love with how fun these can get. This was knit up using Madelinetosh Tosh Merino in the thyme colorway for the contrasting stripe and Malabrigo Merino worsted in natural for the main color. 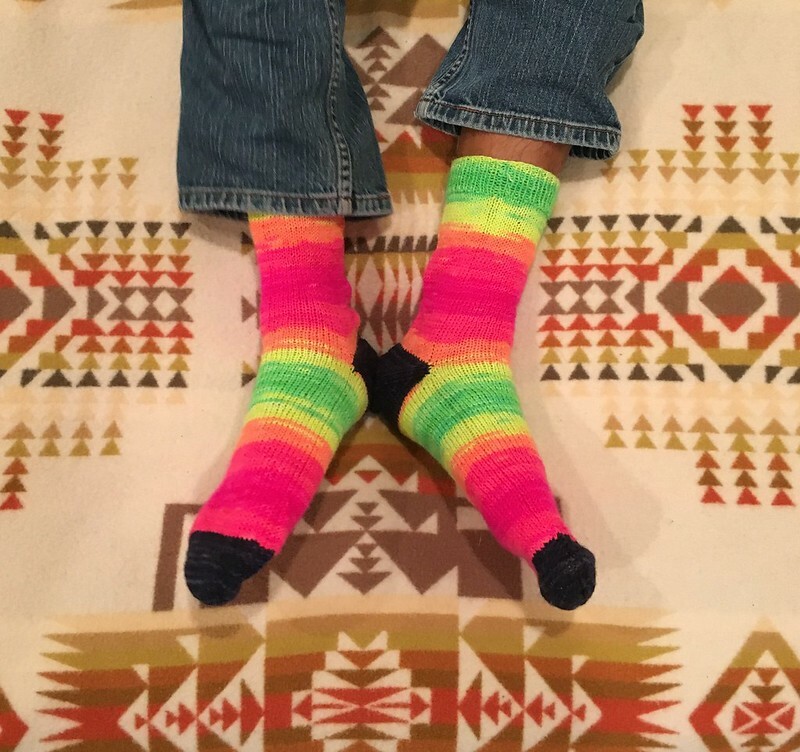 The original pattern is solid, but I found inspiration in a few striped ones at Ravelry. And instead of a little tassel at the top, I opted for a tiny pom in Malabrigo Merino worsted in golden ochre. Brilliant. I’m going to make one in white, black, and red, too. The ideas, they swirl. The babies, they will be warm, this winter. For this hat, I plan on making these little baby socks in the thyme color to match. This past Sunday, I started my first quilting project. My mum has quilted for years, though not rabidly, and I asked if she would begin to teach me this winter. My mum does all her quilting by hand–and I, too, hoped to try the same. We set out with a simple, but attainable, first project: a Christmas themed table runner for my dining room. I decided on some cheeky old fashioned feeling fabrics because I like my Christmas’ to be fun more than stuffy. So far, in one session, I have cut and pieced the entire runner. I have also basted on the quilt backing, and now, I just have to decide what kind of hand quilting I will do on top. Dreaming of new projects. This yarn is the incredible Quince and Co. Owl Tweet, which I’ve used before. The colorway is Buffalo Plaid and it’s to die for in person. Finally, some finished snaps of my Karusellen hat by Erica Knits, available in Pom Pom Quarterly Issue 14 (have I mentioned I love Pom Pom Quarterly, and even won their #valentoes competition last year! See my winning socks here and here). I love the finished result but still haven’t decided to pom or not to pom this version up. 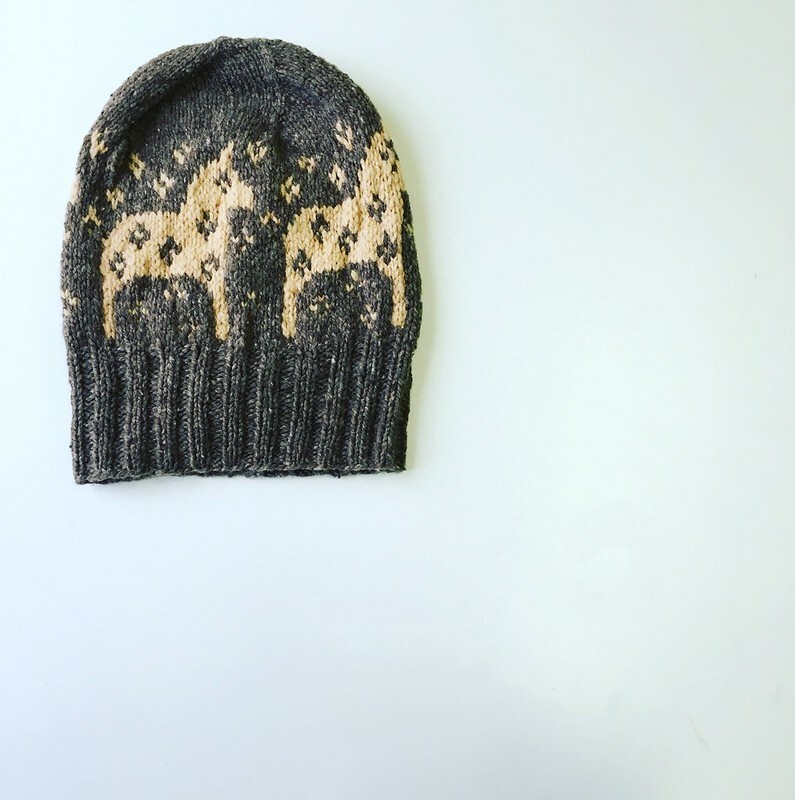 This was knit using three skeins of Brooklyn Tweed shelter–nest for the main color and tallow (a newer color way offered) for the horses. You only need the second skein for making the pom pom, so if you want to leave it off, you can get away with just one skein of the Brooklyn Tweed for your main color. I love it so much, I’ve already cast on another one in different colors and some Harrisville Yarn. Stay tuned. I’m really happy with this recent finish off. These are a straightforward afterthought heel sock for Sean–done up like I’ve done a whole host of other pairs for him, with contrasting heel and toe color. 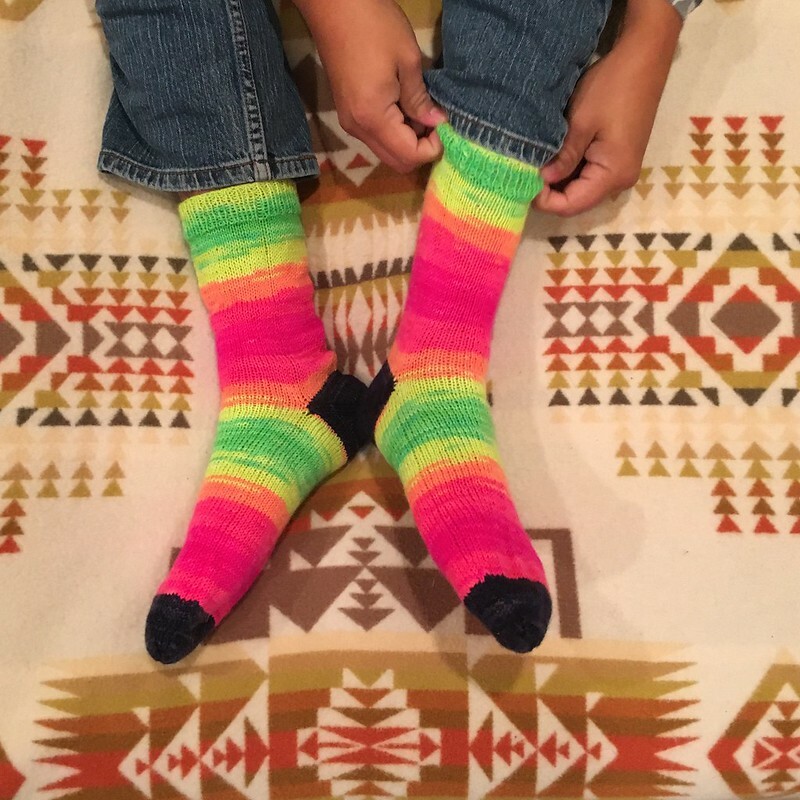 This Regia Fluormania Color in the rainbow colorway is out of bounds bright. But that’s what makes it so fun. I love that these feel like old school ski socks. And I know Sean will rock them wearing all black with a pop of some serious sock–the best way to wear them. Knit up using the aforementioned Regio and some Malabrigo Sock in scraps of Cote D’Azure I had in my stash. I can’t stop looking at these. They are ridiculous. And I love them. 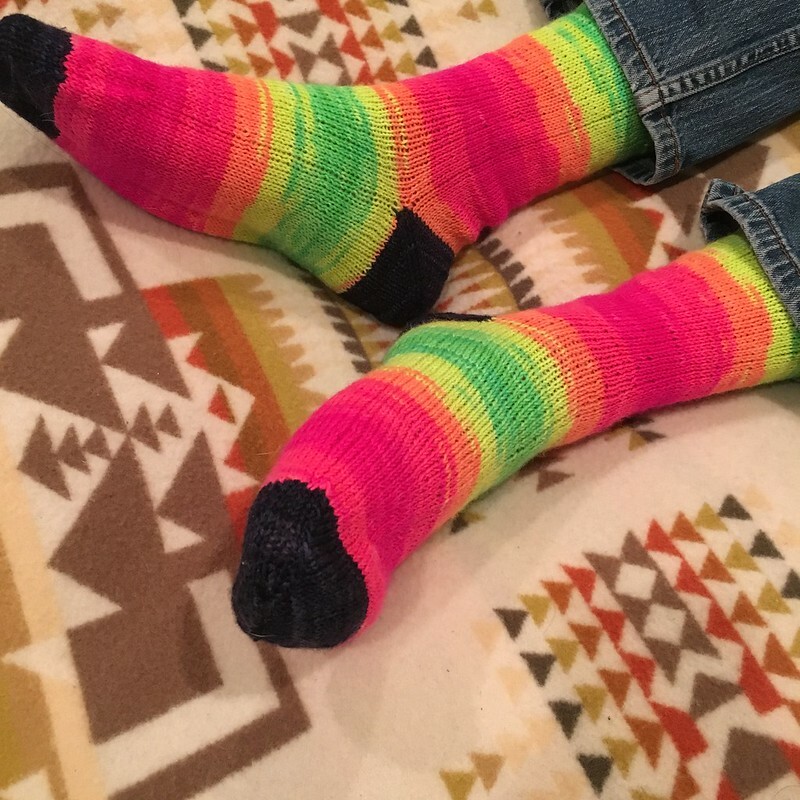 See more snaps of the socks here. A Most Bespeckled Hat, in amazing Malabrigo Merino Worsted in my favorite colorway–sealing wax. Also nods of natural for the specks of white. 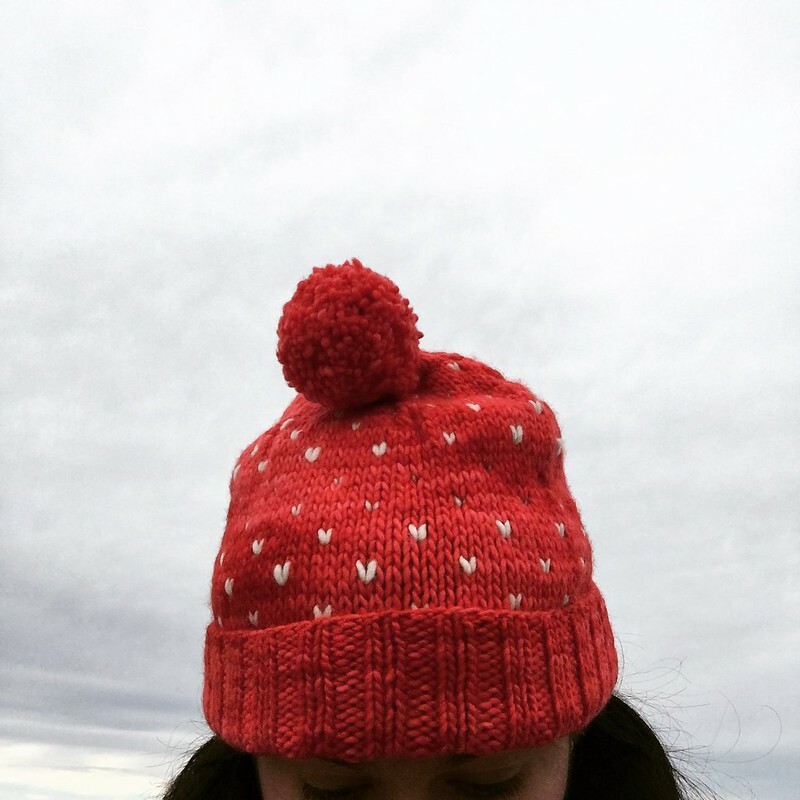 It’s such an easy hat–I think I need to knit one in every colorway for every mood. Grab the pattern here. This past Sunday, I nodded into my favorite antiques shop in Manchester, NH. 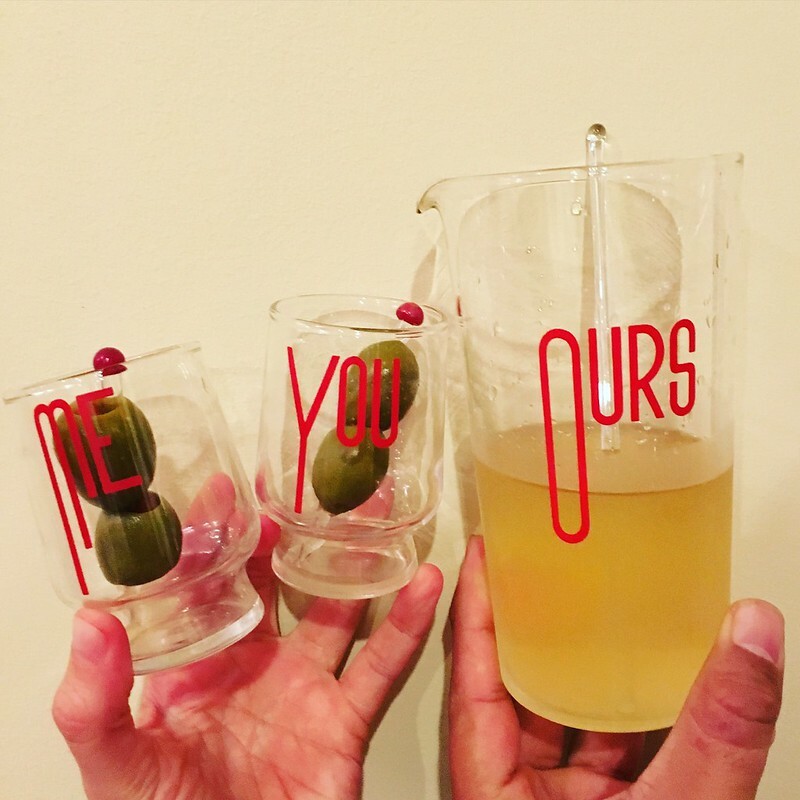 I love it because the prices are great and the mid century modern selections can be to die for. I got this incredible bookcase there for just $35. 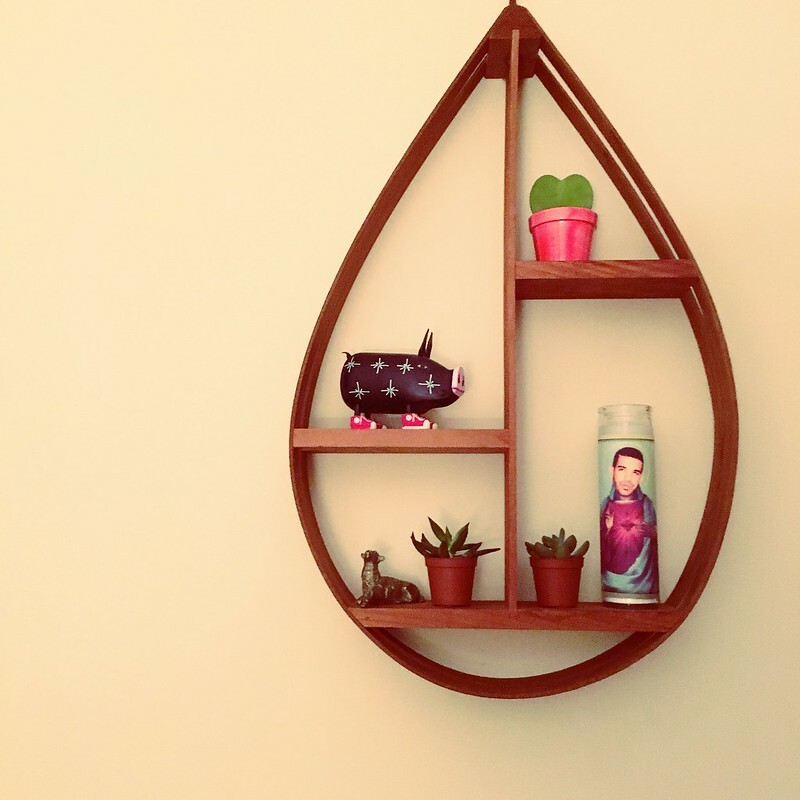 This time around, I found this incredible teak hanging shelf in mint condition for the same price as the bookcase. We have since put it up in the living room above the record rack, and I’m so pleased with how it looks. It’s a great spot to display some of the many little knickknacks I’ve collected along the way–a vintage brass sheep, a Navajo folk art pig, some small succulents, and of course, a Drake Saint candle. Waiting for the perfect piece is so worth it. And, despite loving mid century modern antiques, my home feels very eclectic and not like we stepped into 1955. I love that about it. I have done it. 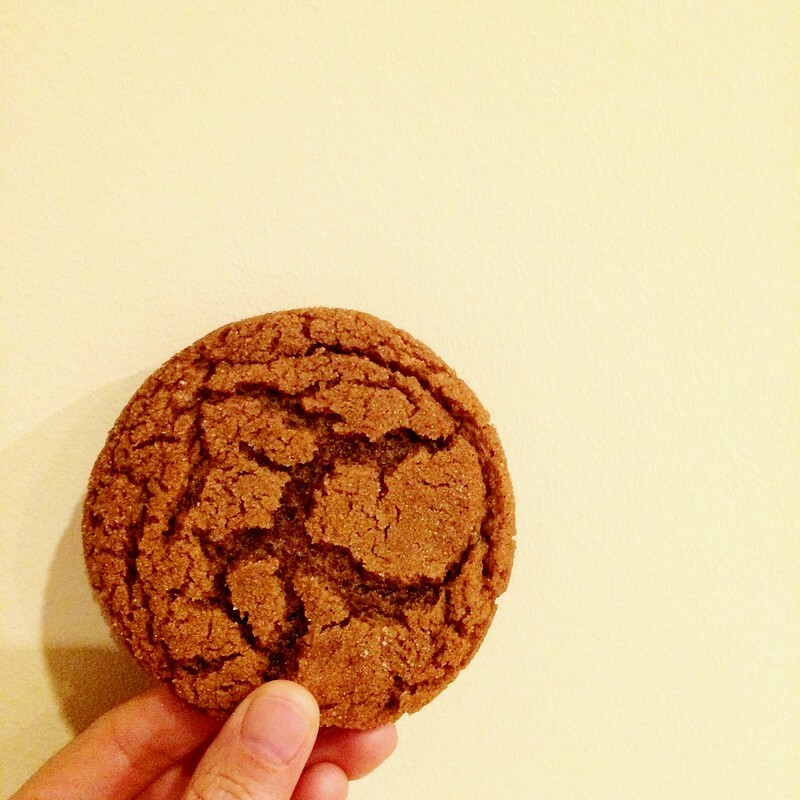 My ginger snaps are pretty damn good, if I pat myself on the back a little. But, I’ve managed to perfect making 24 perfectly round and symmetrical cookies in one go.